All chronic viral infections and autoimmune imbalances, such as H.I.V., A.I.D.S., hepatitis A, B, and C, Herpes Zoster, Human Papillomavirus (HPV) commonly referred to as genital warts. Systemic infections caused by a weak immune system like PCP and candidiasis*. Aim light Immunologic Revitalizer Plus ® is contraindicated in pregnant women. A woman in a serious condition, if pregnant, should take a maximum of one capsule per day under strict medical supervision. Aim Light Immunologic Revitalizer Plus ® will not interact with other drugs or medicines. Aim Light Immunologic Revitalizer Plus® has no known secondary effects. How supplied: 90 capsules plastic bottle with a childproof cap wrapped in security shrink plastic film. Posology: one to two capsules per day. IMPORTANT: consult your health-care professional before making any changes to your lifestyle or if you are taking a prescription medicine. Authorized by the Florida Department of Agriculture and Consumer Services (F.D.AC.S), made and distribution in USA. Regulated by F.D.A. - U.S. Food and Drugs Administration. Each capsule contains: vitamins, oligo-elements, minerals and enzymes. Other ingredients: magnesium stearate, silica gelatine, glycerine and water. PayPal—eBay's service to make fast, easy, and secure payments for your eBay purchases! This is our more powerful version of our Immunologic Revitalizer. The formula has been adjusted to produce a faster response for those cases in which time is critical. It is the Extra Strength Immunologic Revitalizer. 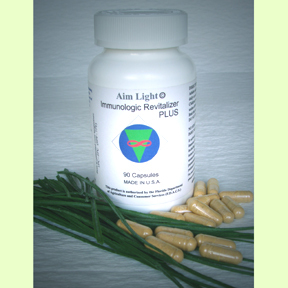 Aim Light Inmunologic Revitalizer Plus is a powerful Immune Activator. It activates the immune system in patients with chronic viral infections and autoimmune imbalances such as allergies, infections, and blood disorders, HIV and related immune disorders, and many degenerative diseases such as cancer that also fall into this category*. It helps to prevent infections and combats viruses. Our Immunologic Revitalizer Plus ® is a potent combination of high quality and extremely pure enzymes, oligo-elements and vitamins that work by producing intracellular enzymatic catalysis and the hydrolysis of the immune system. In most cases, our capsules may be administered orally with water in a completely non-invasive way and in the cases when the patient cannot swallow, it could be administered through a nasogastric tube or stomach bypass dissolved in phisiological solution. Cancer: Solid tumors like those that occur in organs, such as the breast or the lung, and Liquid tumors, which consist of blood cells that have become cancerous where Leukemia and lymphomas are the most common blood cancers. Many patients under our solid and liquid treatment undergo Quimotherapy without nausea, vomiting, dizziness, or hair loss and most important they can avoid the use of morphine to help with their pain*. Diabetes type I and II :Our medication is not an oral antidiabetic agent, instead, it actuates by other mechanisms that do not interact with the available medications; however, due to the fact that it normalizes the glucose level in the blood the medication must be reduced to avoid causing hypoglucemia*. Please consult your doctor before doing any changes to your lifestyle or to your medication. The effect it produces is grater than the addition or combination of its chemical components due to the biocathalysis and hydrolysis that trigger the cellular cleaning mechanisms and consequently through the body as a whole*. Rheumatic diseases, Skin and Connective Tissue Diseases like Systemic Lupus Erthematosus, Rheumatoid Arthritis, end-plate sclerosis, HEPATIC CIRRHOSIS*. Produce an increase in our own defense mechanisms and there are usually radical improvements during the first week*. All natural products with no side effects. There is no interaction with any medication that the patient may be receiving. The patient may continue with the standard treatment. Our products are manufactured in the U.S.A. under a strict quality control. Our products are authorized for sale over the counter as a dietary supplement by the Florida Department of Agriculture and Consumer Services (FDACS). Our patients report improvements in their general well being after only a few ingests of our product. There is usually a dramatic change within the first week. Food absorption increases and the patients tend to gain weight. The use of pain therapies with morphine and/or codeine is usually unnecessary because patients report little or no pain within days of treatment*. There is a significant reduction in the size of the tumor and oncological markers tend to move towards their normal levels*. There is a significant reduction in the viral infection of the liver and the enzyme levels move to their normal levels and stabilize*. There is a significant reduction in the viral load and a dramatic increase in lymphocyte T (CD4/CD8) cell count. Diarrhea stops increasing food absorption with a consequent weight gain*.